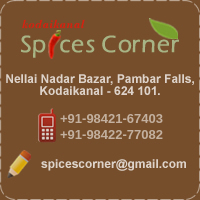 Kodaikanal Spices Corner is entitled as one of the trusted name in the business of manufacturing and supplying Indian spices, home made chocolates and other herbal products from the hill station of Kodaikanal. Our products are widely acclaimed and have created their space in the domestic market. We are offering a range of these products, it include of powdered & non-powdered spices, Natural Oils of Kodaikanal, Herbal Teas & Coffees, Mouth Watering home made Chocolates and others. Our products are hygienically processed and unadulterated. They are fresh and made with proper care with variety of flavors. Our spices are rich in their nutritional value and are used to add taste and spice to the food. These exotic spices are scientifically packed to retain there natural flavor and aroma. Besides the spices the other products such as perfumes, body massage oil, souvenirs from India and others are prepared with great combinations of herbs and plants. Incepted in the year 1999, with the experience 10 years, Spices Corner located in Kodaikanal is counted among the leading manufacturers, suppliers, stockiest and wholesalers of an exclusive range of essential and aromatic oils, herbal teas, coffees, mouth watering chocolates & spices. Our wide product line encompasses natural oils, aromatic oils, natural spice oils, pure clove leaf oil, clove leaf oil, crude clove leaf oil, eucalyptus oil, clove terpene etc. Prepared using natural herbs, eucalyptus & these oils are used in various medicinal preparations, food items, beverages and utilized in aroma therapies. Owing to a vast application area, we offer our range of products are also used in perfumery, cosmetics, and dietary supplements to name a few.